In today’s competitive environment, delivering superior guest service is a critical success factor. It’s the service you provide that sets you apart. In order to meet the challenge of ever increasing customer expectations equip your staff both technically and professionally and let them enjoy their job. In this article we would like to focus on technology used by customer service staff in hotel and hospitality industry. We assume that you are familiar with some of customer service tools for hotels already, but hope you’ll find some new useful ideas here as well. Today you will hardly find a hotel that performs management of properties, equipment and personnel using old-fashioned, paper-based methods. The new technology era of business applications has radically changed hotel management and its operations, from saving files and records to cleaning and cooking. The Property Management System (also known as PMS) technology market offers a wide range of applications designed with the specific needs of hospitality industry in mind. From basic solutions covering operational functions of the front office to highly sophisticated systems providing insights into sales analysis, marketing research and planning, housekeeping optimization, energy management, etc., PMS is the key tool to facilitate guest service efficiency, minimize wait time and ensure delivering a better guest experience. In general, by automating functions like guest bookings, guest details, online reservations, sales and marketing, food and beverage costing, quality management and many others, PMS make life far easier for hoteliers and let them better focus on service and quality in everything they do for their guests. Wondering how you can ensure delivering the best possible online customer experience? Looking for innovative new ways to engage prospects browsing your website? Then it’s about time you check out Live Chat software. For many potential customers your website is the first point of contact with your hotel. They form opinions before having set a foot at it, just through what they experience online. When it comes to getting a reservation confirmation, quote or just an answer to a quick question, making prospects wait for a call back or a return email may drive them to your competitors. By implementing a Live Chat tool on your website you give your visitors the option to reach you within a click of a mouse to get any kind of information they might need, in real time. Live Chat is less expensive compared to call center service and rich with multiple advanced features that can improve hotel online customer service. When it comes to last minute changes in arrangements or urgent reservation inquiry, hotel support agents should be ready to tackle any questions, concerns, and issues quickly and efficiently. If they manage to help a customer in time, it will create a positive image of the company, and also might help to earn more loyal, repeat clients. With the growing popularity of sharing travelling experiences online, social media becomes a larger and more powerful marketing and customer service tools for hotels. It really pays to know what’s going on through the mentions in blog posts, forums, Twitter and Facebook and timely respond to situations that could damage your reputation. On the other hand, a quick response to positive tweets and Facebook updates is just as important as responding to complaints. So start monitoring conversations on your hotel now and use this valuable information to improve your guest service where needed. Social media is also an incredible resource for staying in touch with your customers and engaging with them. Encourage them to become your followers on social platforms by offering a discount or special offer, and do your best to drive participation. Share news and updates on your special offers, deliver interesting, relevant content that encourages your followers to interact with you. When the audience participates, especially on social networks, it creates buzz around you and your business. And as people “Like,” comment, or share stories, their participation becomes visible to their networks (your new prospects!). 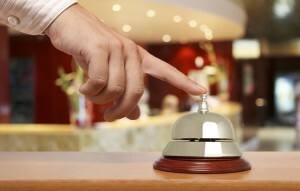 How do you use technology in your hotel to improve Guest Service? Please share your experience on using customer service tools for hotels with us. Your comments and suggestions are welcome and very much appreciated. This entry was posted in Articles and tagged customer service tools for hotels, hotel customer service tools. Bookmark the permalink.